Tone deaf and can’t hold a note? 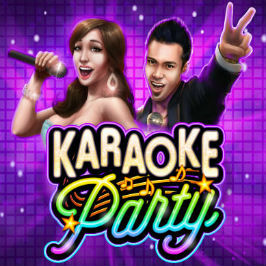 You don’t need to worry if you struggle to sing or are scared of going on stage as anyone can enjoy this Karaoke Party online slot. The five-reel game from Microgaming brings the fun of the sing-along to your computer or mobile device, while wild symbols, free spins and gamble features bring extra winning opportunities to the party. Everyone’s invited, so let our review guide you through how to play. The theme of this Microgaming slot is exactly what it says on the tin. The dark purple hues of the background and the vibrant colourful symbols on the reels capture the party feel well, and as you’d expect there’s an upbeat backing track to boot. Players have a wide range of betting options. Choose your coin value from 0.01 to 1, your number of coins between one and five and then how many of the nine paylines you’re betting on. You have the standard number of ten symbols here comprising the five card ranks from ten to ace and five characters singing karaoke. There are male and female solo acts, a couple who look like they’re performing the Village People’s disco classic YMCA, a band of lads belting their hearts out and a group of girls in skimpy clothing. It’s a bit cheesy but then, isn’t that the fun of karaoke? The highest-paying of these characters are the two solo singers who dish out 750 times your line bet for landing five. In fact, they offer the same winnings except when it comes to two matching performers, with the female singer paying out three-times and the man paying out two-times. The most lucrative symbols in the whole game are the two bonus icons: the wild and the scatter. The wild is the Karaoke Party logo, which pays out a handsome 10,000 times your line bet for landing five. It also substitutes for all other emblems, except the scatter, to create winning combinations, and when this happens your payout is doubled. The scatter, meanwhile, is represented by dice with the word ‘scatter’, and awards you with 4,500 times your stake if you get five. This is also the key to unlocking the Free Spins feature, as three or more of them will grant you 15 free spins. All wins during this round are trebled and the free spins bonus can perform an encore as the feature can be retriggered. 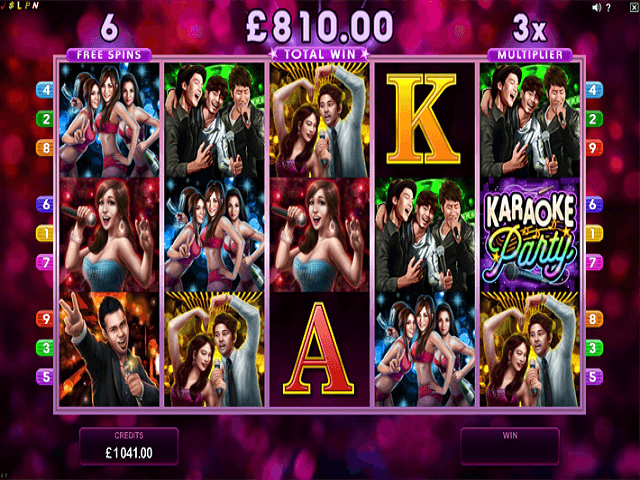 The other bonus feature in the Karaoke Party online slot is the Gamble. After every base game win below a certain limit, a button will appear in the corner giving you the option to gamble your winnings. Here you can guess the colour of a card to double your payout, or the suit of the card to quadruple it. Get it wrong and you’ll lose it all, but if you guess correctly you can keep gambling your winnings until a limit is reached, so you can rack up some nice wins in this feature. Just like karaoke itself, there’s the potential to be a star and keep coming back for more. 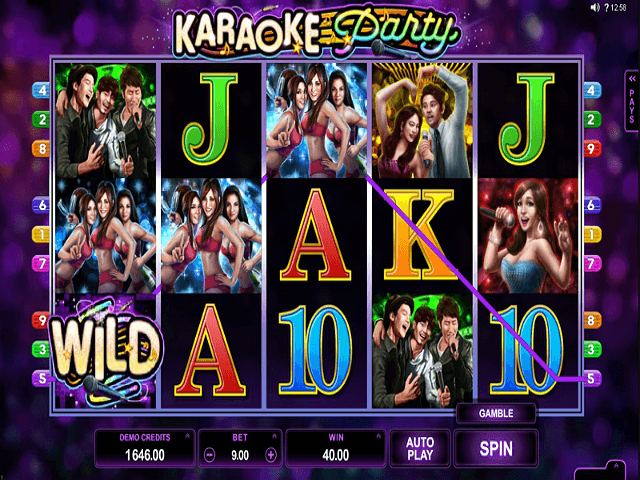 With lots of opportunities to multiply your winnings, the Karaoke Party slot can make even the shyest player sing and shout! 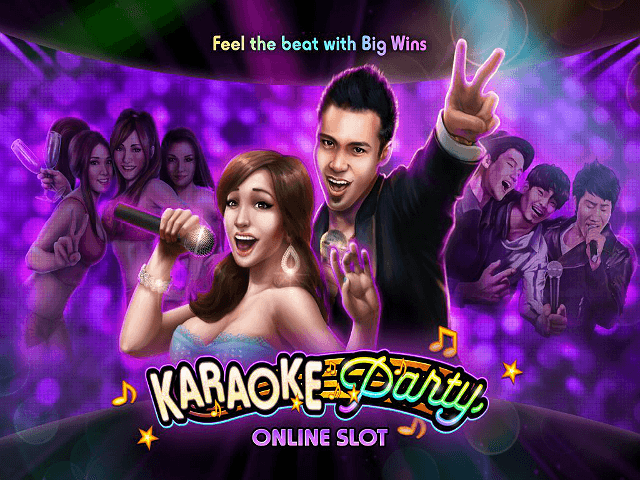 If you like Karaoke Party - You'll like these slots too!